Researchers spotted a shark close to a family’s boat. Pilot Wayne Davis exudes a sense of modesty when you ask him about the captivating aerial photos he takes of great white sharks from his two-seater plane while hovering along the coast of the Monomoy National Wildlife Refuge in Chatham. “People say, ‘You take tremendous pictures,’ and I say, ‘I’m just a fish-spotter who carries a camera. No more, no less,’” said Davis in a recent interview about his work for state marine biologist Greg Skomal and the non-profit Atlantic White Shark Conservancy. “You just keep shooting, and you’ll eventually get some good shots,” he said. Davis, it just so happens, gets a lot. Nearly each time the conservancy shares on Facebook one of the photographs captured by Davis as he hums above the lapping waves of the Atlantic Ocean, it goes viral. 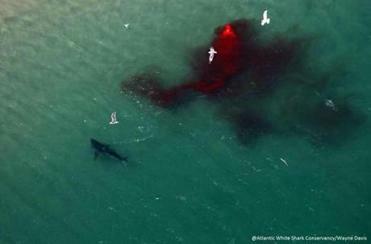 Dramatic photos of the shark’s mealtime near Chatham remind us how rough nature can be. Read: The realization hit: The shark was right there. 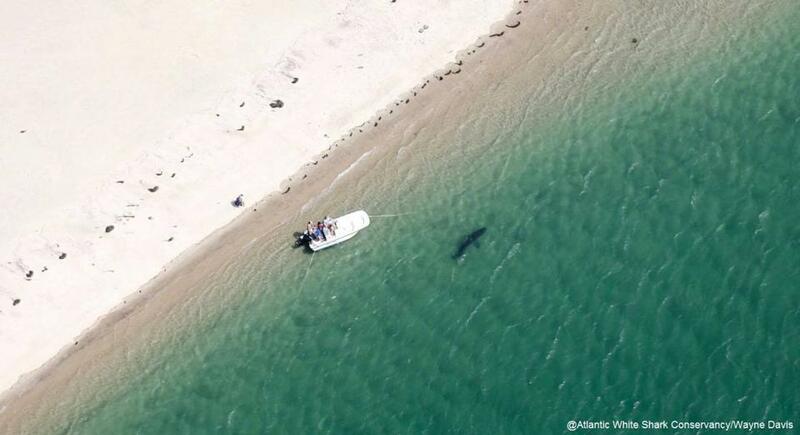 There was the picture last week that Davis took of a great white nearing a boat occupied by a Weston family on the harbor side of a secluded Cape Cod sand strip, called the North Cut. Then there was the picture of a 15-foot white shark chasing a grey seal just north of the Nauset Inlet on July 6, the animal’s sharp dorsal fin cutting through the greenish waters, creating a ripple of whitecaps as it neared its meal. The seal got away, and the picture was shared hundreds of times on social media. And on July 18, Davis witnessed and photographed what the conservancy called a rare and “dramatic predation,” when a great white chomped into a seal, creating plumes of swirling blood that looked like red clouds in the emerald water. Similarly, the episode garnered national attention online. Davis, who as a kid enjoyed climbing to the top of boat masts to gaze out at the water, still insists it’s simply all in a day’s work. “It’s all about timing up there as a photographer — even though I don’t call myself one,” Davis said. Twice a week, Wayne Davis flies his single-engine plane along the Cape Cod coast looking for sharks. Davis, 69 and a Vietnam veteran, began working with the conservancy and state biologists three years ago, helping them track and tag great whites off Cape Cod to better understand the migratory and hunting patterns of the fearsome ocean creatures. 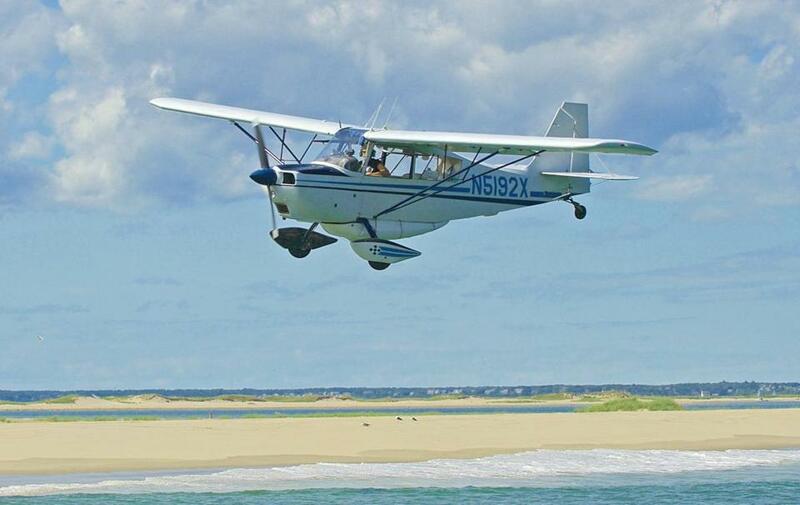 Twice a week, Davis boards his Citabria, a small single-engine plane, and travels up and back between Nauset Beach and part of the Monomoy refuge, looking for the sharks. A former commercial fisherman who grew up in a fishing village in Rhode Island, Davis got the job flying along the coastline through his friendship with Skomal, the state’s resident shark expert. Davis’s shark-spotting skills are a key component of the ocean expeditions of Skomal and the conservancy. When he eyes a shark swimming in the area, Davis quickly radios down to researchers on a boat below, so they can rush toward the shark and capture video footage of the animal and attempt to tag it. Then, Davis takes out his camera to get an aerial picture of the shark’s activity. The images are more than just bait for the conservancy’s followers on Facebook — they help experts estimate the shark’s size by comparing it with the length of the bow pulpit at the tip of their vessel. His bird’s-eye-view is also essential in collecting a count of sharks swimming around on a given day. Davis said that if not for Skomal and the conservancy, he would likely be home “planting tomatoes,” not spending his time in the sky. Since the 1970s, when he first began flying, Davis has served as a spotter pilot for harpoon fishermen hunting for swordfish. But his work was winding down until he was asked to aid experts in 2013 with their shark research. And it serves a purpose.